Is Chan Kong Choy running for life? PUTRAJAYA: Transport Minister Datuk Seri Chan Kong Choy has gone on a two-week leave due to health reasons. He needs to go abroad for a medical check-up and consultation, his press secretary Ng Kok Wai said in a statement Wednesday. Prime Minister Datuk Seri Abdullah Ahmad Badawi approved the leave, said Ng. Chinese daily Guang Ming Daily News has a different approach on the issue. It is reported in the Chinese daily that it is learnt that Chan was severely pressurised from various issues including the RM4.6 billion PKFZ scandal and road accidents involving bus drivers. Tuan Lee Sing Chooi minta MENTERI PENGANGKUTAN menyatakan perkembangan Zon Bebas Pelabuhan Klang (PKFZ) dan setakat ini berapa buah syarikat tempatan dan syarikat asing sudah bersetuju melabur di PKFZ dan jumlah FDI ke PKFZ yang telah diluluskan. Tuan Lee Sing Chooi to ask the MINISTER OF TRANSPORT to state the development of Port Klang Free Zone (PKFZ) and the number of local and foreign companies that have agreed to invest in PKFZ and the amount of Foreign Direct Investment (FDI) on PKFZ that has been approved. Kerja-kerja pembangunan Zon Bebas Pelabuhan Klang (PKFZ) telah bermula pada 1 Julai 2004 dan sedang berjalan lancer mengikut jadual. Kemajuan pembangunan keseluruhan sehingga kini ialah 97 peratus dan projek ini dijangka siap sepenuhnya pada 1 November 2006. Sehingga kini syarikat Aker Kvaerner dari Norway telah mengesahkan penyertaan mereka di PKFZ bagi menjalankan industri pengilangan dengan jumlah pelaburannya berjumlah RM175 juta atau USD48.6 juta. Syarikat tersebut telah pun menandatangani perjanjian bersama dengan Port Klang Free Zone Sdn. Bhd., syarikat yang ditubuhkan untuk mengurus dan mentadbir PKFZ. Di samping itu, Port Klang Free Zone Sdn. Bhd. sedang mengadakan rundingan dengan 58 buah syarikat yang menunjukkan minat dan komited untuk melabur dan menjalankan aktiviti perniagaannya di PKFZ. Dari jumlah tersebut, 31 buah syarikat merupakan syarikat asing dan 27 buah syarikat merupakan syarikat tempatan. RM2 mil for BN Sgor ADUNs, explain where is it! BN ADUN for Ijok K. Parthiban was interviewed by Malaysiakini.com as saying that each BN ADUN in Selangor is allocated RM2 million a year as constituency development funds. “I give priority to youths since I am a young man myself. I have organised many sporting events such as futsal and badminton to keep them occupied. I built badminton courts for them,” he said. These are funded through an annual development fund of RM2 million allocated to each state assemblyperson in Selangor, he explained. • If each BN ADUN enjoys RM2 million annually as constituency development funds, what it means is that Selangor State Government will have to fork out RM108 million in total just for constituency development funds alone. • RM108 million should be regarded as a huge amount for a state government and it is equally astonishing that not a single BN ADUN has ever been accountable to the allocation by announcing how the allocation was spent for the past few years. And if we review the performance of our ADUNs in Selangor, such huge allocation for them to be disposed as “constituency development funds” is totally not matching with their performances at all. Moreover, the State Assembly Hall has lost its function to be an effective platform for ADUNs to raise matters concerning the people of Selangor. For example, the Selangor State Assembly Hall was only convened for about five days last year and the year before, even the last seating was only convened for one day and only 5 oral questions were answered. This shows that the Selangor State Assembly Hall has lost its shine as an effective platform for the people to voice their opinions on matters concerning Selangor through their elected State Assemblymen/women, whom more than 90 percent of them are from BN. If BN ADUNs fail to play an effective role in the Selangor State Assembly Hall to speak up for the people, which is their most basic and fundamental responsibility to be discharged as elected ADUN, then what excuse they could have to enjoy hundreds of million ringgit as “constituency development fund”. For the information of the public, each BN MPs enjoy up to RM2 million as constituency development funds, which is increased from RM500,000 to RM2 million. The State Government also spent more than RM30 million to renovate the current Selangor State Assembly Hall which is completely a white elephant as it is never used for more than five days a year. We wish to stress that such astronomical amount of allocation is not personal property of BN but the money form taxpayers. It will be a laughing stock if the state government spent tens of million of ringgit to renovate the Selangor State Assembly Hall building but has never used it for more than five days, it will even be a bigger laughing stock if hundred of millions of constituency development funds are not made accountable and transparent to the rakyat. Is this they type of “developed state” that the MB wishes to achieve? Is this the benefit of having zero opposition in Selangor, which has been lauded by the MB since years ago? Are all 54 BN ADUNs dare to announce where has this RM2 million gone to? badminton courts for them,” he said. It's RM2 million a year! This is the amount of money allocated to BN Selangor ADUN annually used for their constituency development. This is also the money that keep BN alive in the state as opposition ADUN will never be treated fairly that they can enjoy the same benefit. Of course, if Malaysia were a mature democracy, then development is a must from the government for the people rather then a gift to the people. Looking back to look ahead - this is the title of an interview by The Sun with Parliamentary Opposition Leader, YB Lim Kit Siang published on the 23rd August 2007. Among others, Kit Siang thinks that it’s a very mixed result after the country is coming up to 50 years. "I think when we achieved independence 50 years ago and then with Sabah and Sarawak we formed the Malaysian federation, we all had one aspiration – that we would become more Malaysian over the years. "Which means we would become less Malay, less Chinese, less Indian, less Kadazan and less Iban and so on, but on the 50th year looking around, especially with the events in the last two months, we seem to have become less Malaysian and more Malay, more Chinese, more Indian, more Kadazan and more Iban than anything else." By the way, Sdr Jeff Ooi blogged on it too. So did Kit. Speech delivered by MCA Youth Chief Liow Tiong Lai on 18th August during the MCA Youth National Congress in Malay and Chinese are two totally different speeches whereby the Malay speech was not a total translated version form the original Mandarin version. For example, the sixteen words of “ren bu fan wo, wo bu fan ren, ren nuo fan wo, wo bi fan ren” (人不犯我，我不犯人，人若犯我，我必犯人) in relation to Liow‘s Mandarin speech was not translated in Malay and we can say that the Malay and Chinese speeches were two totally different speeches. Instead, the Malay translation was only words of praises. What is more regretting is that the full translation was only issued four days (22nd August 2007), this shows that MCA Youth had never intended to prepare the full Malay translation until when DAP put pressure on MCA Youth to check on their sandiwara gimmick. “Hak Orang Melayu tidak boleh dicabar, jika tidak orang Melayu akan mengamok, peristiwa Mei 13 akan berulang yang ianya akan lebih teruk daripada tahun 1969 yang akan menjadikan Kuala Lumpur padang terkukur. “Maka berdasarkan fakta-fakta ini, Pemuda dengan tegas menyelar tindakan bekas Presiden ASLI (Institut Kepimpinan dan Strategik Asia), Dr. Lim Teck Ghee yang cuba memutarbelitkan fakta dengan niat ingin menidakkan agenda Melayu, sekaligus merubah kontrak sosial. “Tinjauan Pemuda mendapati hampir 80 peratus daripada jumlah kontrak keseluruhan, pusingannya pergi ke tangan bukan Melayu. “Ini kerana pembekal bahan binaan terdiri daripada kaum Cina yang wujud dalam rangkaian kartel yang begitu kuat sejak sekian lama dari dahulu lagi. “UMNO Selangor mencadangkan agar proses pemberian kontrak secara berkelompok diberi keutamaan manakala syarikat bumiputera yang berpotensi diberi peluang memperoleh kontrak projek mega melalui Inisiatif Pembiayaan Swasta (PFI). “Kita ini sebagai tuan, tetapi tuan apa kalau papa kedana, tuan apa kalau tak mampu, tuan apa kalau selekeh, sengkek dan lembek? Tuan mesti hebat, barulah kita kata kita kuat. “Jika dicabut semua bangunan milik bukan bumiputera di Kuala Lumpur, rakyat boleh melihat bahawa tidak ada apa lagi bangunan yang tinggal. Ibu negara akan menjadi ‘padang jarak padang tekukur’. “UMNO Johor juga ingin mencadangkan supaya televisyen berbayar diletakkan di bawah Kementerian Penerangan dan tidak lagi diletakkan di bawah Kementerian Tenaga, Air dan Komunikasi, dan kementerian itu sendiri mesti diketuai menteri UMNO. “Angka 45 peratus yang sengaja dikeluarkan oleh Institut Strategi dan Kepimpinan Asia (ASLI) itu sengaja mengelirukan kita. There has been a big huh-hah when the government launched the big push on biofuel. One year after the launching of biofuel, the progress is so slow that consumers to date cannot benefit from biofuel, which is a replacement to the conventional fossil fuel. Now, we have a news - Perak's RM1.4 billion biofuel plant cancelled. IPOH: A plan to build the country’s first biofuel plant project in Trong near Taiping is off and the state government is not saying why for fear of legal action. Tajol Rosli was responding to queries on whether the company Pioneer Bio Industries Corp Sdn Bhd had briefed the state government on the project. It has been reported that Pioneer Bio Industries Corp Sdn Bhd, the inventor of the nipah or mangrove palm-based ethanol, would invest RM1.4bil to set up the country’s first plant to produce biofuel on a large scale. Its chairman Md Badrul Shah Mohd Noor has been quoted as saying the factory would be built in a 1,000ha area where some 6,000 wild nipah trees are found growing in Trong, about 82km from here. In January, a grand ceremony was held to unveil the company’s five-storey building and announce the project. STICKERS and leaflets plastered on lampposts, street signs and public utilities have long been an eyesore, but some advertisers have gone one step further by advertising their services on large banners and bunting. A number of these have sprouted around Petaling Jaya, especially in the SunwayMas Commercial Centre and Aman Suria areas. Aman Suria residents committee chairman Wendy Chan said the banners had been up for at least a year, and had become an eyesore. She said it was the Petaling Jaya City Council’s (MBPJ) responsibility to do their job by enforcing rules and taking action against those who put up the illegal banners and bunting. Call at your own risk: Banners and bunting put up by money lending companies are especially prominent. “They’ve been there for so long. MBPJ officers should conduct enforcement on their own initiative instead of waiting for residents to point out the problem,” she said. Chan said she would raise the issue at the next Petaling Jaya Utara (PJU) monthly meeting with MBPJ, which is chaired by Damansara Utama assemblyman Datuk Lim Choon Kin, and attended by residents’ representatives in PJU. Kg Chempaka resident Zubir Suardi noted that these advertisements were more prominent in the commercial areas, though there were some in residential areas. “The advertisements used to be in the form of small stickers, but they’re growing bigger in size and increasing in number. Eyesore: MBPJ says they could not clean up illegal advertising in some areas due to a shortage of staff. “I’ve seen MBPJ enforcement officers passing these areas, but they’ve never done anything about the banners,” said the 49-year-old labourer who also frequents a park in nearby SS25. “Some banners and bunting were put up as recently as two weeks ago,” said M. Balakrishnan, a lorry driver who has been working in Dataran Prima and Aman Suria for 10 years. The 60-year-old said he had seen MBPJ enforcement officers issuing parking summonses around the SunwayMas and Aman Suria areas, but they had never taken down any of the banners. The most prominent banners are those put up by money lending companies, though there are others offering services like tuition, computer repair, printing, house renovation and car wash, as well as promotions by restaurants and optical companies. Illegal: Poster-sized banners posted by the roadside are now part of the scenery in many areas of PJ. When contacted, MBPJ public relations officer Zainon Zakaria said the enforcement unit made daily rounds to check on illegal bunting and banners. However, she said some areas may have been overlooked due to a shortage of staff. She said the council would take down all illegal bunting and banners in Aman Suria and other areas in Petaling Jaya soon. Zainon said those who wished to advertise using bunting and banners should apply for a special permit from the council. “They should submit an application to the licensing department. This can be done over counters 8, 9 and 10 at the MBPJ office. “When an application is sent, it’s charged according to its size,” she added. She said that the council had taken down 9,228 bunting and banners between Jan 1 and Aug 12 this year. I am now in Perak State Assembly Hall, waiting to present a memorandum to the Parliamentary Select Committee on Integrity. I will present something on the scandalous Port Klang Free Zone in which the government has bailed out using a total of RM4.6 billion taxpayers money. DAP Selangor would like to refer to the various media reports on the RM4.6 billion PKFZ (Port Klang Free Zone) scandal under the authority of Port Klang Authority (PKA) to the Parliamentary Select Committee on Integrity . PKFZ is modeled after the highly successful Jebel Ali Free Zone in Dubai and it was conceptualized as the region’s hub of choice for the export and trans-shipment of manufactured goods. However, six months after its completion, the ambitious PKFZ now resembles a ghost town, with only about a dozen tenants scattered about the site instead of the anticipated crush of clients, raising question marks on the viability, feasibility and integrity of the project. Recent reports in Malaysiakini (http://www.malaysiakini.com/news/69074), Singapore Business Times and The Sun (http://www.sun2surf.com/article.cfm?id=18941 and http://www.sun2surf.com/article.cfm?id=18951) have reported about the Federal Government’s RM4.6 billion bail out on the PKFZ project with taxpayers’ money. • The PKFZ had been approved on the assurances that it would both feasible and self-financing. It is proven to be neither so. • The controversy over the purchase of the 1,000 acres for the PKFZ, with the Finance Ministry and Attorney-General Chambers proposing forcible land acquisition at official valuations – then at RM10/sq foot – but the port authority bought it at RM25/sq foot on a willing-buyer-willing-seller basis and the Transport Ministry’s assurance that the PKFZ would be both feasible and self-financing. • The multi-billion ringgit cost overruns were unauthorized and therefore illegal as any RM100 million increament in a project’s cost had to be first approved by the Ministry of Finance and this had not been done. • The Transport Minister had illegally and without sanction from the Finance Ministry issued letters of support to enable Kuala Dimensi, the private company tasked by the Port Klang Authority to develop the site, to issue bonds in excess of RM4 billion to cover its costs – the totality of which have now to be bailed out by the Federal Government. The unauthorized and unlawful letters of support by the Minister of Transport “were instrumental in getting the bonds at the time a triple-A rating” as such letters “are akin to government guarantees”. General public demands an explanation not only as to why the total amounts involved for the project jumped from RM 1 billion (Dec 2004) to RM3.1 billion (June 2007) and now RM 4.63 billion, but also whether the RM4.6 billion bail out from the Federal Government on PKFZ project with taxpayers’ money goes against the National Integrity Plan (NIP). The National Integrity Plan (NIP) was launched by Abdullah in May 2004 and proclaimed a five-point NIP Target 2008. Its first target is to “effectively reduce corruption, malpractices and abuse of power” with the specific objective of improving Malaysia’s ranking in the Transparency International (TI) Corruption Perception Index (CPI) from 37th place in 2003 to at least 30th position in 2008. Sadly speaking, we have been heading in the opposite direction in the past three years, falling to 39th placing in 2004 and 2005 and plunging to 44th placing in 2006, with all signs of further drop to 50th placing this year when the nation is celebrating its 50th Merdeka anniversary. Therefore, DAP Selangor would like to make a strong urge to the Parliamentary Select Committee on Integrity that the whole scandalous bail-out worth RM4.6 billion on Port Klang Free Zone should be given grave concern as it will pose far reaching impact on our standing in the TI CPI this year. • Oil subsidies which can be used to reduce the fuel price 30 sen cheaper than now when the government decided to increase fuel price by 30 sen/litre on 28th Feb 2006 in which the exercise was said to have saved the government a total of RM4.4 billion in terms of fuel subsidies. Spend RM1.7 bil to build another LCCT? Sometimes, I just don't understand how things work in Government agencies when I read this news about LCCT not being a permanent building after the government spent RM108 million to construct the terminal. The terminal was opened in March 2006 and is currently handling 10 million passengers a year and it will soon reach it 15 million passengers limit in two years time, meaning that the terminal only has a life span of three years! Does this mean MOT (Ministry of Transport) waste RM108 million to construct a terminal which can only be used for three years and three years later the Ministry has to fork out another RM1.7 billion ringgit to build an all new LCCT. making the total expenses to construct a terminal for low-cost carriers mount up to RM1.808 billion? Something is wrong in MOT when they could not plan before build! KUALA LUMPUR, Aug 12 (Bernama) -- The present Low Cost Carrier Terminal (LCCT) at the KL International Airport (KLIA) is never meant to be a permanent terminal, Transport Minister Datuk Seri Chan Kong Choy said Sunday. He said it was built to meet the urgent need at that time. permanent terminal from day one," he told reporters when explaining the rationale for the decision to build a new LCCT, which can cater up to 30 million passengers a year, close to the KLIA. Chan also pointed out the RM108 million existing terminal could not be expanded due to space constraints. number of budget carrier passengers as the present terminal will reach its 15 million-a-year-passenger capacity in two years' time," he told reporters after opening the Arts of Wong Teng Hee - A 70 Retrospective Exhibition. Chan said the existing terminal was already congested with almost 10 million passengers a year since its opening in March last year. the capacity to accommodate 30 million passengers a year. An industry expert said, the new LCCT project, announced by Deputy Prime Minister Datuk Seri Najib Tun Razak on Thursday, would cost about RM1.7 billion. Asked what would happen to the existing LCCT, which was completed in just eight months, Chan said several options are being considered, including converting it into a cargo terminal. EYE ON MALAYSIA becomes BLACK EYE ON MALAYSIA – Tourism Minister must explain! It is interesting to read an exclusive from Malaysiakini.com that the Ministry of Tourism is bailing out MST Ad Suria, an event management company formed in 2004 company to run the 'privatised' Eye on Malaysia. expected by the ministry are simply missing. and MST Ad Suria are trying to revitalize the Eye on Malaysia. have been snapped up by the ministry from the private company. I had raised the issue in 3rd January 2007 in a statement that is this another mega project without proper public consultation and accountability? At the beginning of 2007 when the government was busy promoting Malaysia’s 50-year nationhood and Visit Malaysia Year 2007 (VMY2007), mainstream media had also started promoting various tourist spots for VMY2007. 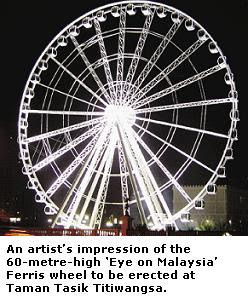 Among others is this 60-metre high 'Eye on Malaysia', similar to the 'London Eye', which will be unveiled at the launch of VMY2007on Jan 6 at Taman Tasik Titiwangsa, Kuala Lumpur. Tourism Minister Tengku Adnan said it would cost RM30 million to set-up the wheel and discussions were still ongoing whether the structure would remain a permanent feature after VMY 2007, indicating that the structure could be dismantled after 2007 and there is no pre-planning at all on this project. Piling work began at Taman Tasik Titiwangsa end of 2006 where a 60m-high Ferris wheel with 42 gondolas was installed as one of the major attractions for VMY2007. Each of the Ferris wheel’s air-conditioned gondolas can carry eight adults. “Eye On Malaysia” was then believed to be able to provide city folks with a view of the Kuala Lumpur skyline. The Ferris wheel is of Swiss technology and was specially brought in as one of the main attractions for VMY 2007. Malaysians are surprised as to why such huge project which involved a whopping RM30 million minimum is not made known to the public earlier for public scrutiny when country’s economy is not performing as it should be, crippled with billion ringgits of losses due to the gigantic flood in southern Peninsula. Will it not be better for tourist to take the KL Tower amidst the city of Kuala Lumpur at 515m above sea level, which is majestically poised at a breathtaking height of 421 metres to grasp a full view of KL at a greater height and a cheaper entry ticket (RM10 per adult) for a longer time as compared to only 60 metres of Eye On Malaysia at RM15 per entry? Even if you want to enjoy a free view, then Bukit Ampang (nicknamed “Little Genting”) can be a good choice also. If the cost of construction is RM30 million as claimed by the Minister with an estimation of at least two million tourists to tour the Ferris wheel in order to break even based on RM15 entry ticket per person, then a valid question posed if whether this project is capable to attract that minimum amount of tourist in order to break-even, not to mention about making profit. And now the Ministry Tourism has to fork out taxpayers money of RM5.7million to bail out the MST Ad Suria. The whole argument is whether such wastage of public fund could be avoided again if the government is sincere to walk the talk by having proper public consultation first before putting the cart before the horse when the government only informed the public only when the construction of the project started. We therefore demand the Ministry of Tourism to validate the reports and explain this matter. When Malaya achieved independence in 1957 and Malaysia was formed six years later in 1963, a national social compact was reached that the nation shall be a secular state with Islam as the official religion and not an Islamic State. The Merdeka social contract and Malaysia Agreement that Malaysia is a secular state with Islam as the official religion and not an Islamic state was given expression in the Federal Constitution, articulated by the founding fathers of the nation including the first three Prime Ministers, Tunku Abdul Rahman, Tun Razak and Tun Hussein and given full recognition by the highest court in the land. For over four decades, there was national consensus of the secular character of Malaysian nation-building which was only disrupted in the past six years, raising questions about the national commitment to protect and sustain this fundamental cornerstone of Malaysian nation-building. This is to send out a clear and unequivocal message on the occasion of the 50th Merdeka anniversary of the nation in 2007 that the Merdeka social contract and the Malaysia Agreement that Malaysia is a secular state with Islam as the official religion and not an Islamic state must continue to be the bedrock of the Malaysian nation-building process. You are invited to the Parliamentary Roundtable to endorse the reaffirmation of the Merdeka social contract and Malaysia Agreement that Malaysia is a secular state with Islam as the official religion and not an Islamic state. I apologise for the shortness of time. Kindly inform my office of your ability to accept this invitation or your representative to the Parliamentary Roundtable by Wednesday, 8th August 2007. (Contact person Lau Weng San 016-3231563, 03-79578022, Wong Choy Onn, 016-2681483). Majlis Fatwa Kebangsaan hari ini memutuskan untuk membenarkan penggunaan dakwat khas yang dicadangkan oleh Suruhanjaya Pilihanraya (SPR) bagi menanda jari pengundi dalam pilihanraya umum akan datang kerana ia tidak melanggar hukum syarak. Pengerusinya, Prof Datuk Dr Abdul Shukor Husin berkata keputusan itu dibuat berdasarkan penjelasan dan hasil kajian yang dijalankan oleh Jabatan Kimia dan Universiti Kebangsaan Malaysia (UKM), demikian menurut laporan Bernama. Katanya, kajian mendapati bahan dakwat yang tidak dapat dipadamkan itu tidak mengandungi unsur najis, tidak menyekat air atau telap air sampai ke kulit dan tidak mengandungi kemudaratan yang jelas untuk dipakai di jari atau kuku. "Oleh sebab itu, jawatankuasa yang bersidang hari ini meluluskan atau membenarkan penggunaan dakwat tersebut. "Tidak ada halangan dari segi hukum dan tidak ada keraguan," katanya kepada pemberita selepas mempengerusikan mesyuarat tersebut hari ini. Dr Abdul Shukor berkata keputusan itu tidak membabitkan hukum atau fatwa baru tetapi untuk melihat dari aspek umat Islam dalam soal beribadat. Katanya Jabatan Kemajuan Islam Malaysia (Jakim) akan memaklumkan secara rasmi dan serta-merta kepada SPR berhubung keputusan tersebut. SPR sebelum ini mencadangkan untuk menggunakan dakwat khas itu untuk menanda jari pengundi bagi mengelakkan penipuan dalam pilihanraya. Berikutan itu, Jakim menghantar sampel dakwat khas itu kepada Jabatan Kimia untuk dianalisis bagi memastikan dakwat yang kekal pada jari selama dua hingga tiga hari itu tidak mengandungi bahan najis yang boleh merosakkan ibadat umat Islam. Semalam, Pengerusi SPR Tan Sri Abdul Rashid Abdul Rahman berkata keputusan daripada Majlis Fatwa Kebangsaan itu perlu bagi mengelakkan keraguan dan syak di kalangan umat Islam bahawa dakwat khas itu boleh menjejaskan ibadat. All religions consider water as sacred and God's gift to people. Islam acribes the most sacred qualities to water as life, sustaining and purifying resources. Christianity states that in heaven and earth, water symbolizes life in its pristine form. The Orang Asli believe that water is ruai (soul) and is a sacred life force, which is a pre-requisite for life. Hinduism considers water as one of the main forces or elements of Nature, which must be respected, prayed/worshipped, conserved, and utilised as a basic need for all human beings and living things on the earth. Buddhism believes that water is one component of the five elements (fire, air, earth, water and wisdom), which form the universe. Please register by sending your details (name, contact number, email address and name of organisation) to monitoring.globalisation@gmail.com or call or text Simon Lee at 012.633.2349. To confirm participation, please fill in the registration form and make payment by cheque to MSN Diversified Sdn. Bhd. RM20 will be collected to cover cost if venue, facilities and resource materials.